Within the second and third quarter of 2018 the detailed definitions of the Level 1, Level 2 and Level 3 Corridor Services as well as of the Supporting Services were finalised and approved by the consortium. 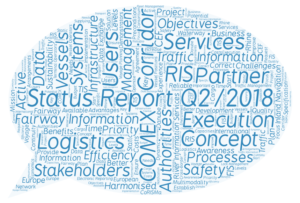 The RIS COMEX Implementation Plan was elaborated defining for each Corridor Service in which Corridors/Countries it will be realised in the course of the project (as far as possible related to time and resources). Furthermore, based on detailed investigations of already existing systems, it was agreed by the project Steering Committee to re-use the Flemish VisuRIS system to realise the defined Corridor Services on Pan-Corridor Level within RIS COMEX. In that respect several tasks have started to pave the way for that solution by means of a necessary Cooperation Agreement among the partners as well as to establish the legal basis for the required international RIS data exchange.